$23,000/each, and I am eating the cost of assembly for both motors at that asking price. Save yourself the immense amount of time and patience it took to custom build these beauties! These are brand new fuel injected motors from the ground-up (not rebuilds). The engine builder, Mark Dalquist of Throttles Performance in Fargo ND, is highly respected in the drag world for building high horsepower engines. The purpose of this build was to design (2) 400 cubic inch high performance boat motors that were technologically advanced (distributor-less ignition), reliable, and low maintenance. The engines are overbuilt for better marine durability, as the quality of the parts used within the build would easily support 700+ HP. New Dart SHP engine blocks, MS3-Pro fuel injection systems allowing for lots of engine customization w/ custom made wiring harness and computer mount. Special order Race Tec pistons, SBC bullet custom hydraulic roller camshaft, TPIS miniram intakes with custom powder coated finish, TPIS billet throttle body, Brodix Racerite 200cc hard anodized cylinder head assemblies, Callies Compstar crankshafts, 850cc fuel injectors, and more. 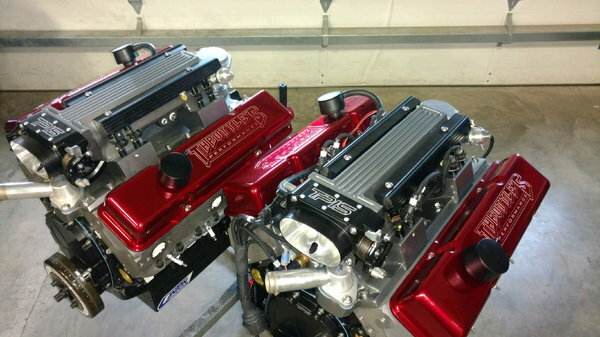 Both engines are dyno tuned and ready to go. 0 hours on the motors. (except for time on dyno) See the pictures for a screenshot of the dyno sheet and also for the power curve of both engines....which matches up almost exactly. Engines are temporarily located in the Lake of the Ozarks.